TIRANA, Albania (CNN) -- "Dead men massacred." That's what Dr. Liri Losci says he saw -- and videotaped -- in the village of Izbica, nestled in the Drenica Valley in Kosovo. 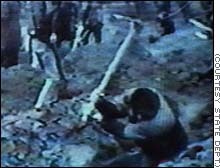 One hundred and twenty-seven men, executed, villagers said, by Serb soldiers on March 28. "The Serbs, came, began shouting, threw us out of our homes and took everything we had," said one villager. "Then they separated the men from the women and children and chased them out of the village. The men were kept back. We were put in three different lines. They began shooting." "When the Serbs began shooting, I fell on the ground, pretending to be dead," he said. "Slowly I crawled on my stomach towards a small hill and slid down the hill into the bushes." A third man said he hid in the nearby bushes, unable to move as the Serb soldiers surrounded the village. From his hiding place, he said, he heard their voices and saw their feet. The soldiers were there for two days and then they left, he said. 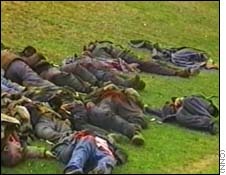 The Yugoslav government has denounced the pictures of the alleged massacre as fabricated propaganda. On Wednesday, however, the U.S. State Department held a special briefing, saying the newly released video matches aerial photographs of suspected mass graves that NATO released last month. "These kind of episodes have taken place. This is not the only example -- but it is the only time we've been able to match actual videotape with overhead imagery," spokesman James Rubin said. 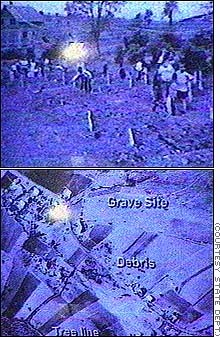 The combined imagery was being made public, Rubin said, because the United States believes the Serbs are returning to the mass graves to destroy the evidence of their crimes. The film will be submitted to an international war crimes tribunal at The Hague, Netherlands, Rubin said. CNN was unable to independently verify Losci's pictures, but Correspondent Amanda Kibel sought out Kosovar refugees who said they had escaped the incident. Losci says he arrived on the scene a day after the killings, pointed in the direction of Izbica by some of the women who had fled the village. Fleeing from the Serbs himself, Losci decided to get a close-up look at what had happened there. "Dead men massacred, men in three groups in a large valley at the bottom of a mountain," he said. "We saw three groups of dead men, the first two 20 meters apart and another group about 600 meters away. It was dark, and very hard to recognize the people. That night we decided to bury these people. They were our people, and it was the least we could do for them." Losci said he couldn't sleep more than two hours that night, and returned to the site the next morning. He and a group of other men from Izbica and surrounding areas began organizing the burial of the dead. Some began to identify the bodies, others to dig graves. Then, Losci says, he decided to film what he had seen. His own camera had been left behind in his burned-out house, but a villager had hidden a video camera in the ground. Losci used it to tape the macabre scene. "I wanted the world to know what terrible things were happening here," he said. Most of the men who died in Izbica were elderly, because the young men fled to the mountains two or three days before, villagers said. They had heard, said the survivors of massacres in other villages, that the Serbs kill only men. Sadik Tahiri said he survived by pretending to be dead and then escaping into the mountains. "Nine Serb soldiers stood in front of us, about five meters away," said Tahiri. "They shouted 'Turn around!' then the commander shouted in Serb two or three times, 'Fire, fire!'" The soldiers fired, Tahiri said, and everyone fell. "I fell, too," he said. "One old man fell over my leg. He was dead. Anyone that moved on the ground they shot, too." Anife Zekaj was forced to leave Izbica, leaving her husband behind. Later, her nephew found her, and told her he had been killed. "We heard the cries and the shooting," said Feiton Zekaj, who said he was hiding in the mountains. "When we heard the Serbs had left, we went back and found the dead men." Olivera Zekaj said the Serb troops separated the men from the women and ran the women out of the village. "We were not more than five kilometers from the village when we heard the machine guns," she said. 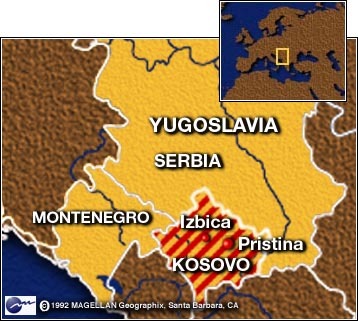 The refugees said that when they tried to return to Izbica to see for themselves what had happened, Serb soldiers stopped them along the way. International organizations who viewed Losci's footage reacted with revulsion. "We cannot let the perpetrators of such hideous crime go unpunished," said Daan Everts of the Organization for Security and Cooperation in Europe. "This should trigger even more intensive efforts to put an end to the conflict." "This is repetition of what happened in Bosnia, and we did not stop it, and it continues, so as much as we as a humanitarian agency have to be neutral, it doesn't mean we need to be naive and stupid," said Barshad Rastegar of the U.S.-based agency Relief International. "We are there to protect and preserve human life, and each one of these individuals is a family, is a universe," he said. "These are innocent human beings. I do not find it difficult to call for action." Correspondent Amanda Kibel contributed to this report.